In September 1923, Tommy Ladnier recorded Play That Thing with Ollie Powers' orchestra. Not less than 6 takes of that tune were recorded out of which 4 takes have been preserved. The first two takes were scrapped, probably due to technical problems recording and balancing this rather large orchestra - 2 cornets, trombone, clarinet, alto sax/C-melody sax, piano, banjo, tuba, and drums (cymbals). 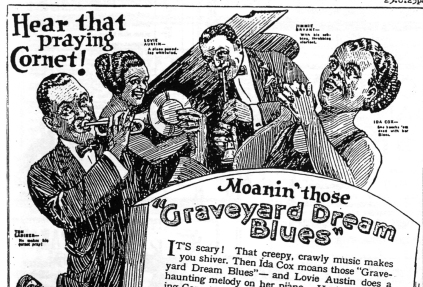 Another example of Tommy Ladnier's "Praying" cornet style is Barrel House Blues made by Lovie Austin and her Blues Serenaders accompanying Ma Rainey. The intense and superb Ladnier solo exhibits many of his blues phrases and it belongs to his best solos. His tone at one point almost breaks, probably in a combination of fierce vibrato and plunger mute use. Rhythmically, this solo is very complicated with Ladnier playing between the beats, making a transcription scholastically rather misleading. His frequent use of triplets is another interesting feature. The rhythmic complexity is further enhanced by Lovie Austin’s playing; sometimes playing on the beat and sometimes playing behind, creating an impression that the tempo sometimes slows down. Since the piano is the only instrument to mark the rhythm, the beat is rather felt than actually heard. The piano and cornet thus create some polyrhythmic tensions that are unique.